that would translate the feel and look of the image that would be presented on metal. Print Ready to Hang on Wall…..$550. A copy of this image can be purchased at the Venvi Art Gallery, which represents my art work. You may call the gallery at 850-322-0965 or you may email them at email@VenviArtGallery.com. 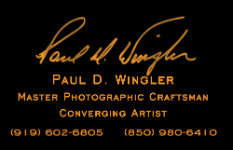 Or, go to go to the website at venviartgallery.com/paul-wingler.htm/ l and check out all of my work at that site. If you’re in the Tallahassee area, please feel free to stop by their gallery at 2901 E. Park Ave., Tallahassee, FL. and ask about other works I offer there.